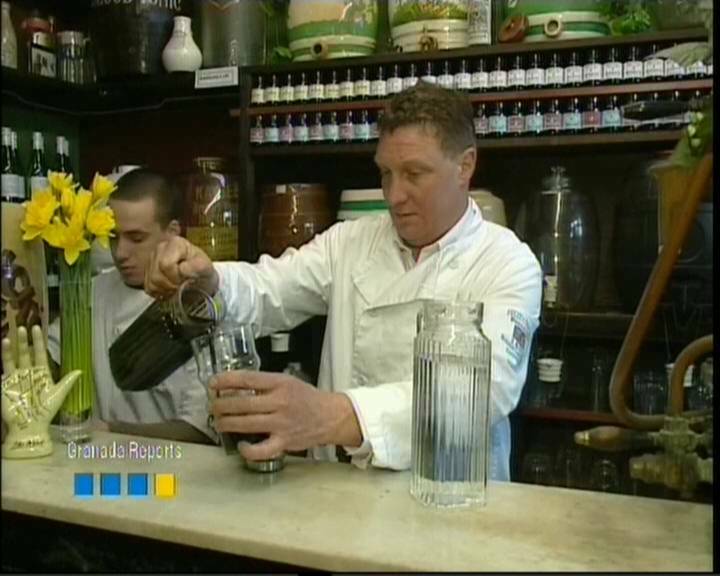 Prior to paying his £2 entry charge for a Twenty20 match between Rawtenstall and Ramsbottom last night, Third Man dropped into Malachi Fitzpatrick’s Temperance Bar and Emporium. The Fitzpatricks, an Irish family of herbalists, started their business in 1899 and at one time had as many as thirty establishments. The Rawtenstall emporium is the last of the line. In fact it is the last temperance bar in the country. Third Man selected a Blood Tonic Cordial which, with its fruity raspberry taste and principle ingredient of rosehips, is claimed to be an effective treatment for the rheumatoid arthritis that is likely to result from spending three hours outside watching cricket in this coldest, wettest, darkest of Junes. The town is located deep in the steep sided valley of the Irwell, north of Cottonopolis, to which for a hundred or more years it dispatched its considerable manufactures. 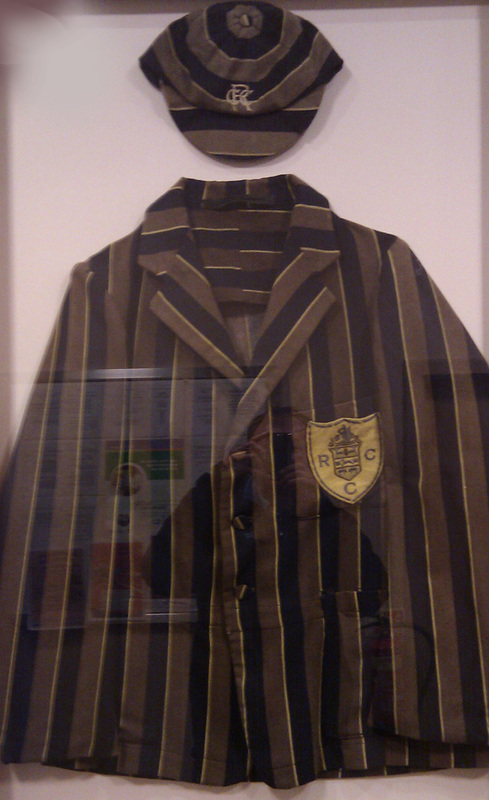 The Cricket Club has a history dating back to the early 1880s and a fin de siècle blazer and cap worn by their star batsman Fred Pickup is displayed in a new club house built above the steep bank of seating where the Town has habitually gathered on Sundays to watch their team compete in the Lancashire League. 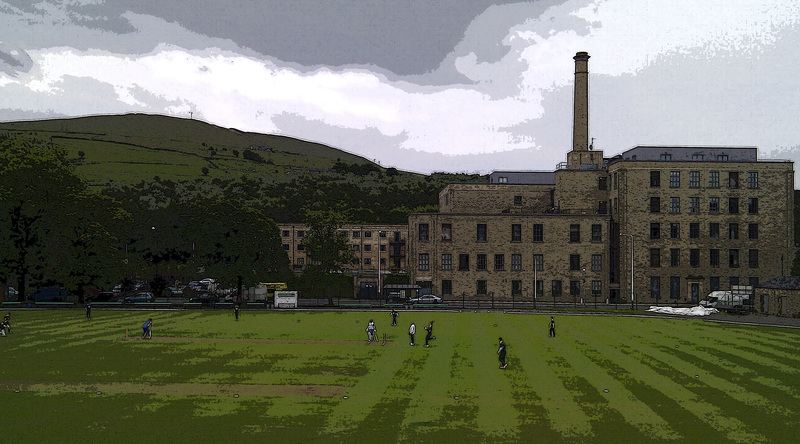 Rawtenstall took on its first professional in 1883 paying him 30 shillings a week but for that they expected him to prepare the ground, bowl to and coach the amateurs, oh, and score fifty runs and take seven wickets in every match. Their ground is situated on the Bacup Road at the other end of which reside their great rivals. The photograph above shows an expectant home crowd packed across the banking, about to enjoy the 1949 cup final derby against Bacup. In the 1920s Nelson CC led the way by becoming the first club to employ an overseas star when they signed the Australian fast bowler Ted MacDonald. 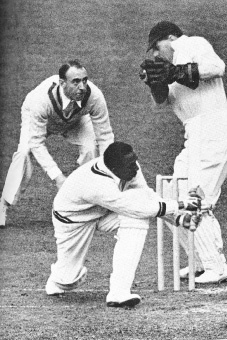 In 1929 they engaged the services of a professional who was to set the Lancashire League on fire – the West Indian firecracker, Learie Constantine. Rawtenstall’s answer in 1931 was to sign the 58 year old Sydney Barnes who at that time had taken 3,373 wickets including 189 test match victims. ‘Barnie’ began well against the Blackburn side of East Lancashire. His 7 for 30, including a three over spell that produced 5 wickets without conceding a run, guided Rawtenstall to victory. A massive crowd was therefore guaranteed for the confrontation between Constantine and Barnes. The West Indian began with 96 not out in Nelson’s 175 and he followed this with 4 for 34 as Rawtenstall were bowled out for 103. Barnes did not otherwise disappoint, ending the season with 115 wickets at an average of 6.3, but Rawtenstall finished fourth in the League, ten points behind Nelson. Yesterday evening, with dark clouds overhead and rain on its way, the Banking was sparsely populated. Across the road the once dynamic Ilex Mill has been converted into flats, but its outline still calls to mind a scene from Lowry. The home side made a meagre 99 which their opponents, from down ‘The Valley’, knocked off for the loss of only four wickets. When Barnes and Constantine had their duel, the smoke from countless chimneys would have filled the valley and the views of the South Pennine Moors that now grace this ground would have been glimpsed only once a year when the mills closed for Wakes Week – providing it wasn’t raining of course. Third Man likes to imagine that after their match, while the amateurs downed their beers, the two great cricketers slipped out of the ground and made their way to Fitzpatrick’s to share a bottle or two of the Blood Tonic Cordial to ward off the arthritis that curses many a cricketer. Yesterday, our time contraption piloted by C.L.R. James took us to 1932 and a Nelson v Accrington match in the Lancashire League. The Nelson professional, Learie Constantine, is facing the late in-swing and perfect control of Accrington’s pro Ted MacDonald. Ted’s bowling has been nothing short of spell binding. The Nelson crowd sense that at any moment, their professional will explode. 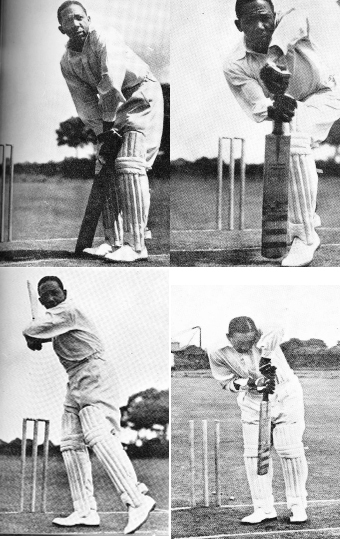 A length ball straightens, pops and the ball flies from the shoulder of Constantine’s bat looping towards slip who perhaps overawed by the opportunity ‘muffs’ the chance. The spell is broken. MacDonald senses the change too. But no-one on the ground knows exactly what is to come. ‘When it does happen no mortal could have foretold it,’ writes James. The same intoxicating uninhibited joy was induced by the batting of Surresh Raina at Dharamsala this Sunday when, after Ramish Powar’s pure and extreme off-breaks had placed the Superkings under the cosh and in danger of being shunted out of the tournament, Raina began to chase down the Kings XI Punjab’s total; not with slogs but with pure stoke play that rivaled Powar’s deliveries for purity of form. Back in 1932, MacDonald, the experienced campaigner does not lose his rag but comes in again with that ‘machine-like run’. Nor does Constantine repeat the stroke immediately. He waits a few balls before leaning forward and again putting the bowler away to fine leg from outside the off-stump. Classical Jazz - is this the shot whose development James describes taken back into First Class Cricket? Just as Tovey believed that the great Romantics invented new means that were perfectly adapted to their new ends, that the only applicable word was classical, so James believes that Constantine’s new leg glance from outside off-stump was a classical shot. ‘Batting will handle new material (if it is new) with classical perfection but only if it is compelled to do so.’ This was the challenge that League cricket provided Constantine. It was not his West Indian flare (a romantic notion) but his West Indian brain that worked out a new and safe way of countering new demands set by the bowler. James asserts that Constantine took these new classical strokes back to Test cricket. He passed his legacy to Weeks and Worrell and Walcott and they to Sobers and he to Richards and Richards to that other Richards. Third Man can remember to this day the first time he saw Barry Richards in a limited overs match calmly break the spell that had pinned every batsmen he’d ever watched before to a leg or middle and leg guard, and, well before the delivery was bowled, step across to a new position outside off-stump and guide the ball for four to long leg. TM thought he’d seen a revolution. Instead, he’d seen the classical tradition developed by Constantine forty years before. ‘Swimming in the caves of league cricket between the wars, to this day dark and unfathomed, Constantine strengthened and flexed his strategic muscles,’ concludes James. As far as Third Man is concerned, you can keep the powerful batsmen whose edges and mistimed shots carry the fence. You can keep your Haydens and Symonds. Just give him the chance to see Sachin Tendulka and Raina, their brains working out new and safe strategies, chasing down the runs. Because Tendulka and Raina among a few others are the heirs to the classical tradition. May their legacy enrich all cricket. In 1965, Third Man played at Old Trafford. We took eight hours to journey north from Hampshire. We schoolboys arrived in a world as alien to someone from the south coast, then, as Mumbai would be now to someone from Morton in the Marsh. Every building was coated in soot. The over whelming memory is of dankness and darkness. Third Man does not recall being struct by an economic divide so much as a cultural divide. One of the small things that amazed us was a pink sports newspaper that contained not just every county score but also the scores of all the league matches. In fact these results were given greater prominence than the scores from the county championship. The Portsmouth Evening News or the Southampton Echo had their county features concentrating on Hampshire and a full set of county scores but there was no mention at all of local club cricket. That cricket was still ‘timed’ and ‘friendly’. There were no leagues anywhere along the South Coast even though TM’s club played from Bournemouth to Brighton and from Basingstoke to Bognor Regis. Play began at 2.30 and finished at 7.30. Enforcing twenty overs in the last hour, TM can remember as an innovation. A result in the match required the side bowling second to bowl out the side batting second or the side batting second to knock off the runs notched up by the side batting first. Victories suggested an unevenness of match more than anything else. TM’s was a touring club, without its own ground, which therefore depended on being good guests to keep its fixtures. A good guest played good cricket (now Premier League Standard), with much humour and familiarity expressed on the field and a generous contribution to bar profits after the match and sometimes before. Sociability was as important as cricketing skills. 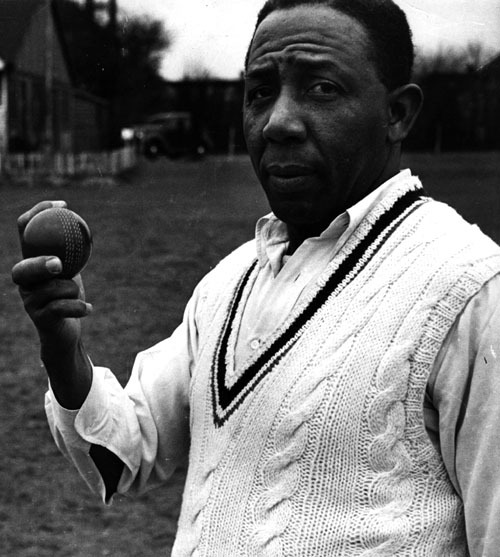 James was endeavouring to put the case that it was through playing in the Lancashire League, playing with matches that provided a result in an afternoon, that Learie Constantine became a finer Test cricketer. “By 1932 when I saw the league, he was no longer a Test cricketer who played in the league. He was a league player who played in Tests. It was after he became a finished league player that he found his finest form in Tests and big cricket,” writes James. Our old friend S.F. Barnes would no doubt have agreed. This assertion is important if we substitute IPL for league in the sentence above. Constantine would have been a top pick for T20. Would it have been the tournament in which he found the key to the expression of his highest talents? Is it where today’s supreme cricketers will find their finest form for Tests and big cricket? A Test bed for all cricket? At first thought we might agree, but James does not. Bradman’s view annoys him. He is embarrassed for Bradman. He believes it is an example of stereotypical thinking about West Indians and West Indian cricket – “We are still in the flower garden of the gay, the spontaneous, tropical West Indians. We need some astringent spray.” A fierce accusation. With Learie Constantine as their 'paid man' Nelson dominated the Lancashire League between 1928 and 1937. What does win first place over a championship, then? James relies on descriptions of just two shots played by Constantine against the bowling of Ted MacDonald playing for Accrington in the 1932 season. Mac Donald had retired from Lancashire but was putting his all into the half-day form of cricket. One can sense the same motivation behind Tendulkha’s monumental achievements in this year’s IPL. One can see these duals everywhere in league cricket today. It is still what brings the crowd on to the ground, this prospect of pro v pro. James would argue that at Nelson in 1932 or at the DY Patil Stadium in 2010 the drama is identical to that of ancient Greek theatre, inspiring and demanding an intense communal engagement from those watching. The crowd of probably 10,000 in Nelson (1932) and 55,000 in Navi Mumbai (2010) sense the battle and are monetarily quietened as the protagonists strut and fret upon their green stage.